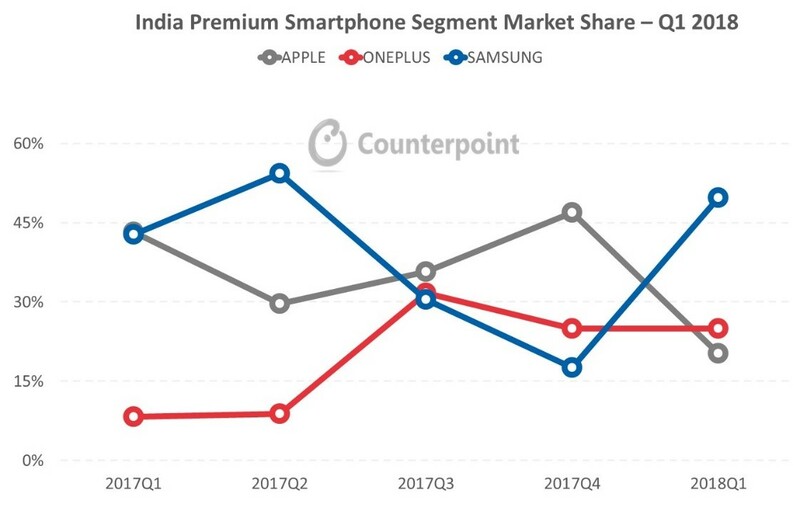 As per Counterpoint Research’s latest analysis on the important Indian smartphone market (see here), the premium smartphone segment remained flat YoY, but declined 13% sequentially due to drop in promotions post festive Q4 2017. Samsung regained the top spot due to strong initial demand for its newly launched S9 series while, OnePlus solidly maintained its second position. Apple had a weak Q1 2018, as demand for its iPhone 8 and X series declined sequentially in contrast to the Chinese market (see here). Additionally, the Cupertino giant had to battle rising import tariffs due to lack of “Make In India” domestic manufacturing capabilities for its portfolio. The import tariffs have increased thrice in the past five months, leading to an increase in the price of already expensive iPhones in India during the quarter. Comparatively, competition is well positioned to manufacture locally even at the PCBA level to remain immune to import tariff hikes. The premium smartphone market contributes to 4% of the overall smartphone market in India, still in the nascent stages as the overall smartphone user base is still less mature. Samsung captured half of the premium segment with 16% YoY growth, driven by strong initial demand of its new flagships S9, S9 Plus and online exclusive Galaxy A8 plus. S9 series promotions were strong both in offline and online channels with offers ranging from cashback (~$100), exchange (~$150), upgrade & data bundling plans across all major operators. OnePlus was the fastest growing brand (+192%) in the segment capturing 25% of the share. OnePlus has been maintaining its second spot in the premium segment which it is has been holding since Q3 2017. OnePlus 5T was the best-selling model during the quarter, driven by its limited edition variant launch and expansion in the offline segment. The highly anticipated OnePlus 6, is likely to cash in on the momentum built by the OnePlus 5T. This year, the brand will expand its presence across multiple cities by opening new stores, enabling it to reach out to a larger user base. Apple’s share in the premium segment dipped as the volumes dipped by a massive 55% due to decline in shipments for its iPhone 8 and X series. Additionally, the increase in import duty on CBUs to 20% during the quarter, led to increase in prices of already expensive iPhones. 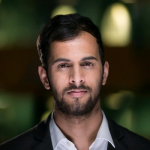 However, the silver lining for the company was its growing presence in the online channel. Currently, almost one in four premium iPhones are sold in the online channel. Online promotions for the older iPhone generation remains strong on both Amazon and Flipkart. Cashback was a popular promotional scheme for older generation iPhones. E-commerce players were promoting “Apple days” in a bid to lure buyers with upgrade and cash back programmes. Cashback and EMI offers were the major promotional activities leveraged by brands in the premium segment, with cashback being used by 9 out of 10 models in the premium segment in online. Other notable brands which have their presence in the premium segment include Google, Xiaomi, LG and new entrants in Q2 2018 to keep an eye on are Huawei with P20 Pro and Nokia HMD with Nokia 8 Sirocco.